It’s not just the anti-Jewish News otherwise known as the AJN that is guilty of poor journalism. I won’t expand on that. Rabbi Telsner was born to be either a Rosh Yeshivah or Rosh Kollel, I am not sure why he didn’t go down those lines. Rabbi Telsner is NOT the Rabbi of the Shule. He was appointed as a Dayan (Judge). I don’t know the Beth Din, but that’s the title. There are many Shules at the Yeshivah Centre. In fact the main one probably has one of the smaller attendances. His approach isn’t followed uniformly by any stretch. Rabbi Telsner is an emotional man, He cares. Rabbi Telsner is not a singing and dancing pulpit Rabbi. Rabbi Telsner gives a good shiur but is not what one would call an orator of note. Rabbi Telsner is prone to old-fashioned responses to halachic issues. The Responsa literature makes him look mild* in comparison. The AJN wouldn’t know what Responsa are. That’s too Jewish for the AJN. Rabbi Telsner is fully devoted to Torah and Mitzvos. The notion of a Chilul Hashem made him resign. I have no doubt whatsoever. He put himself second, and the Yeshivah first. Rabbi Telsner hasn’t got a bad bone in his body. He sometimes shoots back too quickly before an extra moment of contemplation would be better advised. I suffer from the same. Rabbi Telsner protects the rights of women with vigour. 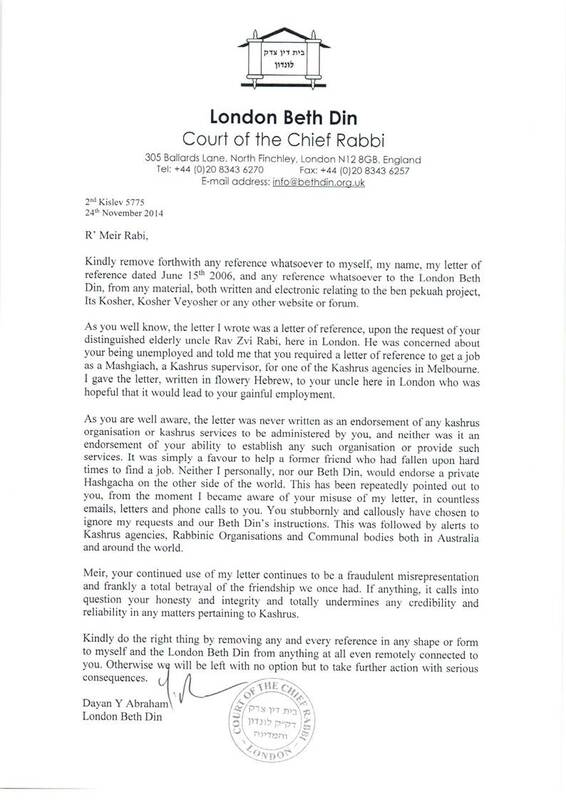 Rabbi Telsner over-worried that some people might succeed in destroying the Yeshiva Centre. Those people cannot and will not. They do have their legitimate issues, and those will and should be dealt with. Some may have already. Others need to be. The centre will flourish once more. There is no doubt whatsoever. I have goaded Rabbi Telsner on Halachic issues and he has yelled and screamed at me in Shule. I don’t get offended. I’m not thin-skinned and I know where he comes from. He screams Torah, but some take it as insults. Rabbi Telsner and his wife have done more than plenty of good. I doubt many Rabbis in Melbourne have the open home that they do. He doesn’t quote Plato or fancy poets: his is the Torah only way. It’s an approach. It may not be everyone’s approach, but I’d be embarrassed if my Rabbi quoted more poets and philosophers than he did real Torah. There is, to my knowledge, zero evidence that has been tendered that Rabbi Telsner sent Malka Leifer away (as the AJN wrote). The courts may decide how that happened, but I don’t believe Rabbi Telsner opined that she should be sent away. The AJN of course knows better. Rabbi Telsner has always supported women’s activities and shiurim and ensured they are accorded respect through their own functions at Yeshivah mirroring ones which in the past were just the domain of males. It is not a sin to hold a view that same gender preference is something that may be addressed (successfully or otherwise). There are a few respected experts in the field who do have such a view under particular conditions and have a PhD and peer-reviewed papers in the area, including people who see them. One can disagree with such approaches, but one can’t condemn a person for subscribing to such (unless they are Fascists or Communists who condemn discourse and dialogue and want to shut up everyone’s mouth). Only a fool thinks that advances in Science and Medicine are frozen in 2015. Rabbi Telsner should have a special Kiddush thanking him for the many fantastic things that he has achieved, and for putting himself second when he could easily have revealed some troubling things in context. On the matter of the sharpness of Rabbinic tongues, check this out from a great of the greats, Rav Yaakov Emden. He would have been sacked in a minute! Well put. Unfortunately, the world and the many worthy and truly upright individuals are judged by others lacking these qualities. Superficiality and first-impressions are the patina that creates reality and that allows the great who may not be masters of the sound-bite to fall by the way-side. Rabbi Telsner may have resigned but the good in all areas of Torah and Mitzvos will endure, and I have no doubt he will continue to provide of his wisdom, knowledge and experience. Sad time for the community. i am shocked and very saddened by rabbi Telsner,s resignation..I hope that things go well for him and his wife.